The first time I heard Grizzlor was a couple years back when Matt Jamison covered their 2015 7″ / EP Cycloptic. The thing that stuck out to me the most was how short and crazy Grizzlor’s songs were without straying into a noise / thrash vibe, which I loved. Just the absolute grooves these three dudes (Victor-guitar/vocals, Jon-bass, John-drums) where able to develop in such a short time span really blew me away. Since that initial encounter with Grizzlor’s Wild Tasmanian Devil type sound I have been patiently waiting for some new material from these guys. 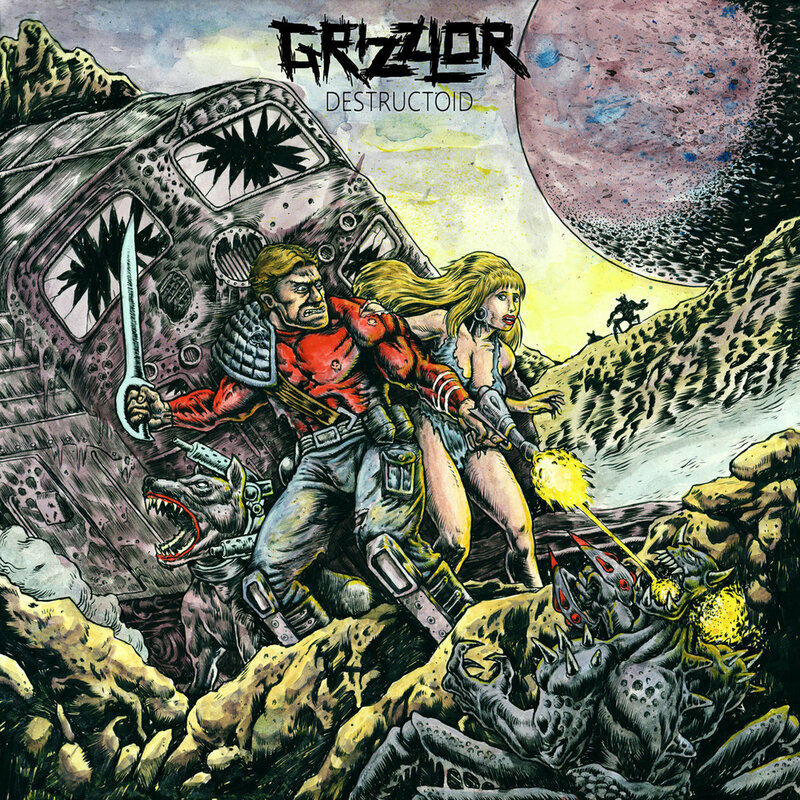 Much to my tremendous delight Matt informed that Grizzlor had a legit full length coming out called Destructoid and it would again be on the excellent Hex Records and to state that I was beyond stoked would be an understatement. I’ve spun the new full length, Destructoid over 10 times and the best way I can describe it is: Destructoid sounds like the soundtrack to that one time back in 1999 when Sasquatch, Beast Man from (He-Man), and the aforementioned Tasmanian Devil had a coke filled booze bender in Vegas for like a solid three days with absolute zero hours of sleep. That three day escapade nearly shook poor Las Vegas and Western Society as a whole to its knees and Grizzlor’s Destructoid may very well do the same thing again once it hits the ears of the masses. Is the world ready for this kind of awe inspiring auditory madness?! I don’t know. What I do know is, if you are into wild hairy beasts that have no regard for public decency, a serious passion for total destruction, and a wanton disregard for all that is sacred and holy then Destructoid should be uploaded into your brain Johnny Mnemonic style. Hopefully our site doesn’t crash or our severs don’t melt from hosting an exclusive stream of such a savage album. Please pray for our survival while enjoying these insanely excellent jams and be sure to snag the album on vinyl Here.